In the geographical distribution the term Wallacea indicates the presence of the species in Sulawesi and the Philippines, *means shared with Sumatra only and **means shared with Peninsular Malaysia only. S.E. Asia means presence in several of the countries from Burma to Vietnam and Thailand. The suggested habitat preference is bracketed if based on less than five specimens. The categories ‘Radio Sabah’ and ‘Summit’ refer to zones on G. Kinabalu above upper montane recognised by Holloway (1970). Beana terminigera Walker. Oriental tropics. Lowland (to montane). Barasa acronyctoides Walker. Oriental tropics. Lowland (to montane) forest. Barasa alopha Hampson. Oriental tropics. (Lowland). Barasa lunisigna Hampson. N. E. Himalaya, S.E. Asia, Borneo. Lowland forest. Aquis viridisquama Walker. Sundaland. Lowland forest. Aquis albida Walker. Sundaland. Lowland to lower montane forest. “Aquis” orbicularis Walker. Indian Subregion, Sundaland*. Lowland to upper montane forest. “Aquita” acontioides Walker. Sri Lanka, Nepal, Vietnam, Sundaland, Philippines, Sumbawa. (Lowland). “Aquita” seria sp. n.. Endemic. (Lowland secondary forest). Melanographia flexilineata Hampson. N.E. Himalaya, S.W. China, Borneo. Lower montane forest on limestone. Dialithoptera gemmata Hampson. Indian Subregion, Vietnam, Sundaland*. (Lowland forest). Ctenane labuana Swinhoe. Endemic. (Lowland forest). Sarbena lignifera Walker. N.E. Himalaya, S.E. Asia, Sundaland. Lowland forest. Proneca fola Swinhoe. Indian Subregion, S.E. Asia, Sundaland. (Lowland). “Meganola” triangulalis Leech. N.E. Himalaya to Japan and Sundaland. Lower montane forest. “Meganola” flexilineata Wileman. Borneo, Wallacea, Seram. (Lowland). “Meganola” scriptoides sp. n.. Sundaland. (Lowland to upper montane forest). “Meganola” nitidoides sp. n.. Endemic. Lower and upper montane forest. “Meganola” ascripta Hampson. Himalaya, Taiwan, Thailand, Borneo. Lower montane forest. “Meganola” cuneifera Walker. N.E. Himalaya, Vietnam, Borneo. (Lowland forest). “Meganola” basalactifera sp. n.. Himalaya, Borneo. (Lowland to lower montane forest). “Meganola” manoboides sp. n.. N.E. Himalaya, Borneo. (Lowland to lower montane forest). “Meganola” apiensis sp. n.. Endemic. (Lower montane forest). Evonima aperta Walker. Sundaland, Thailand, Taiwan. (Lowland forest). Evonima faircloughi sp. n.. Endemic. (Disturbed lowland forest). Evonima kamboranga sp. n.. Endemic. (Upper montane forest). Evonima maculata sp. n.. Endemic. (Lowland forest). Manoba implens Walker. Sundaland**, Philippines. (Lowland and lower montane forest). Manoba tesselata Hampson. N.E. Himalaya, Sundaland, ?Seram. Lower montane. Manoba allani sp. n.. Endemic. Upper montane. Manoba argentaloides sp. n.. Borneo, ?Seram. Upper montane. Manoba harthani Holloway. Endemic, G. Kinabalu only. (Summit zone). Manoba marshalli sp. n.. Endemic. Upper montane, mainly on limestone. Manoba carrei sp. n.. Endemic. Lower and upper montane forest, not limestone. Manoba chirgwini sp. n.. Endemic. (Upper montane ridge forest). Manoba melanomedia Inoue. Taiwan, Borneo. (Lowland hill and lower montane forest). Manoba tribei sp. n.. Endemic. (Lowland heath and lower montane forests). Manoba rennicki sp. n.. Endemic. (Lowland hill forest)? Manoba chamberlaini sp. n.. Endemic. Upper montane forest. Manoba bulli sp. n.. Endemic. Upper montane forest and scrub. Manoba cowleyi sp. n.. Endemic. Lower montane forest on limestone. Manoba briggsi sp. n.. Endemic. (Upper montane ridge forest). Manoba coxi sp. n.. Endemic. (Upper montane scrub on limestone). Manoba goodfieldi sp. n.. Endemic. (Lower montane forest). Manoba potterorum sp. n.. Endemic. (Lowland forest). Manoba gilletti sp. n.. Endemic. Upper montane forest. Manoba coadei sp. n.. Endemic. (Lower and) upper montane forest. Manoba brunellus Hampson. Indo-Australian tropics. Lowland forests and cultivation. Manoba punctilineata Hampson. Oriental tropics. (Lowland). Manoba suffusata Wileman & West. Taiwan, S.E. Asia, Sundaland*. (Lowland forest). Manoba shrimptoni sp. n.. Endemic. (Montane forest). Manoba greenwoodi sp. n.. Endemic. (Lowland hill forest). Manoba major Hampson. Indo-Australian tropics. (Coastal with mangrove). Manoba sp. 17763. Endemic. (Lowland forest). Nola mesosticta Hampson. Indo-Australian tropics to New Guinea. Lowland to upper montane. Nola helpsi sp. n.. Endemic. (Mangrove). Nola jarvisi sp. n.. Endemic. (Lowland to montane forest). Nola canioralis Walker. Borneo, Sulawesi. (Lowland to lower montane). Nola opalina Walker. Burma, Sundaland, Philippines, New Guinea. (Lowland). Nola internella Walker. Endemic. (?Lowland). Nola tarrawayi sp. n.. Endemic. (Lower montane forest). Nola quadrimaculata Heylaerts. Indo-Australian tropics. Lowland. Nola taeniata Snellen. Indo-Australian tropics. (Lowland, including disturbed habitats). Nola euryzonata Hampson. Sundaland. Lowland forest. Nola lucidalis Walker. Oriental tropics. (Lowland). Nola liparisalis Walker. Sundaland**. Burma. Lowland to lower montane. Nola erythrostigmata Hampson. N.E. Himalaya, Borneo. (Lower montane forest). Nola bifascialis Walker. Endemic. (Lowland, disturbed forest). Nola faircloughi sp. n.. Endemic. (Lowland, secondary vegetation). Nola classeyi sp. n.. Endemic. (Coastal, mangrove). Nola marshallae sp. n.. Endemic. (Lowland, disturbed forest). Nola pumila Snellen. Indo-Australian tropics. Lowland and lower montane forest. Nola fraterna Moore. Oriental tropics. (Lowland). Nola calcicola sp. n.. Endemic. Lower montane forest and scrub on limestone. Nola fasciata Walker. Indo-Australian tropics. Lowland and lower montane forest. Nola semidolosa Walker. Sundaland to Sulawesi. Lowland and lower montane forest. Nola mesomelana Hampson. N.E. Himalaya, Sundaland. (Lowland forest). Nola ochrolopha Hampson. N.E. Himalaya, Borneo. Lower montane forest. Nola duplicilinea Hampson. Oriental tropics, Seram. Upper montane ridge forest and scrub. Nola coremata sp. n.. Endemic. Lower montane forest. Nola spinivesica sp. n.. India, Borneo, Bali. (Lowland forest). Nola transwallacea sp. n.. Borneo, Sulawesi, Seram. (Lowland). Nola marginata Hampson. Oriental tropics to Sundaland. (Montane). Nola fisheri sp. n.. Endemic. (Lowland forest). “Nola” sijthoffi van Eecke. Sundaland. (Lower montane forest). “Nola” wilsonae sp. n.. Endemic. (Lowland forest). Selca latifascialis Walker. Endemic. (Lowland). Etanna basalis Walker. Indo-Australian tropics. Coastal, lowland and secondary forest, (montane). Etanna breviuscula Walker. Indo-Australian tropics. Lowland to upper montane. Etanna teleoleuca Prout. Seram, Borneo. Montane. Etanna brunnea Hampson. Indo-Australian tropics. (Montane). Etanna pallibrunnea sp. n.. Endemic. (Montane). Etanna albisecta Hampson. Indo-Australian tropics. (Lowland to montane). Etanna vittalis Hampson. Sundaland to Fiji. (Lowland to montane). Etanna binotata Hampson. Indo-Australian tropics. (Lowland). Etanna albonotata Hampson. Indo-Australian tropics. Lowland to upper montane. Etanna viridifascia sp. n.. Sundaland, Sulawesi. (Lowland forest). Characoma albulalis Walker. Endemic. Lowland to upper montane. Characoma metalophota Hampson. Indian Subregion to Sundaland. Lowland to upper montane forest. Characoma pallidorsum sp. n.. N.E. Himalaya, Sundaland**, Philippines. Lowland to upper montane forest. Characoma fortiscripta sp. n.. Endemic. Lowland to upper montane forest. Characoma glaucopasta Hampson. N.E. Himalaya to Sundaland. (Lowland), lower to upper montane forest. Characoma distincta Bethune-Baker. Sundaland to Bismarck Is. Lowland to upper montane forest. “Pardasena” verna Hampson. N.E. Himalaya to Seram. (Lowland to lower montane). “Giaura” niveidisca Hampson. Himalaya to Wallacea. Lowland to lower montane forest. “Giaura” lichenosa Hampson. N.E. Himalaya to Sulawesi. (Lowland forest). “Giaura” leucophaea Hampson. Burma, Andamans, Borneo, ?Australia. (Lowland). “Giaura” tortricoides Walker. Indo-Australian tropics. (Lowland?). “Giaura” multipunctata Swinhoe. Oriental tropics to Sundaland. (Lowland) to montane. “Giaura” robusta Moore. N.E. Himalaya, Borneo, Palawan. (Lowland to montane). Garella scoparioides Walker. Indo-Australian tropics. Lowland to upper montane forests. Garella rotundipennis Walker. Borneo, Java, New Guinea. Montane forest. Garella ruficirra Hampson. Japan, N.E. Himalaya, Borneo. (Lowland) to upper montane forest. Garella vernoides sp. n.. Endemic. (Montane). Dilophothripa chrysorrhaea Hampson. N.E. Himalaya to Wallacea. (Montane forest on limestone). Dilophothripa alopha Hampson. Burma, Sundaland**, New Guinea. Lowland (to lower montane) forest. Dilophothripa olivia Hampson. Endemic. (Lowland). Nycteola indica Felder. Indian Subregion to Australia. (Montane). Nycteola pseudoindica sp. n.. Sundaland. Lowland, particularly heath forest. Nycteola sinuosa Moore. India, Hong Kong, Sundaland. (Upper montane forest). Nycteola mesoplaga Moore. India, Sundaland**, Sulawesi. (Lower to upper montane forest). Nycteola indicatana Walker. Indo-Australian tropics. (Lowland). Nycteola canaphaea sp. n.. Endemic. (Lower montane forest on limestone). Nycteola kebea Bethune-Baker. Sundaland to New Guinea. (Montane forest). Mniothripa lichenigera Hampson. N.E. Himalaya, Sundaland**. (Lowland). Mniothripa argenteopurpurea Gaede. Sundaland, ?New Guinea. (Hill forest). Mniothripa bradleyi Fletcher. Borneo to Fiji. (Coastal vegetation). Mniothripa translucens sp. n.. Sundaland**. (Lowland, ?coastal). Mniothripa fletcheri sp. n.. Endemic. (Lowland to lower montane). Mniothripa sp. 17096. Endemic. (Lowland). Gyrtothripa parvipusilla sp. n.. Sundaland, Wallacea, New Guinea. (Lowland) to montane forest. Gyrtothripa papuana Hampson. Borneo, Sulawesi, New Guinea. (Lowland to upper montane). Gyrtothripa florida Walker. Sundaland to Bismarcks. (Lowland?). Gyrtothripa erastioides Walker. Endemic. (Lowland to lower montane). Gyrtothripa variegata Hampson. N.E. Himalaya, Borneo. (Lowland to lower montane forest). Chloethripa leucocephala Prout. Borneo, Sulawesi. Upper montane forest. Chloethripa angulata sp. n.. Sundaland**. (Lowland to upper montane). Clethrophora angulipennis Prout. Sundaland. (Lower) to upper montane forest (to 2600m). Chloroplaga nygmia Swinhoe. Sundaland. Lowland (to upper montane). Chloroplaga pallida Warren. Sundaland, Palawan. Lowland (to upper montane). Hylophilodes dubia Prout. Sundaland*, Palawan. (Lowland), montane forest to 2200m. Tortriciforma chloroplaga Hampson. Sundaland. Montane forest. Tortriciforma tamsi Holloway. Sundaland*. Upper montane forest. Tyana marina Warren. Endemic. Lower to upper montane forest. 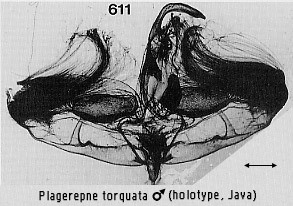 Tympanistes fusimargo Prout. Sundaland. Montane forest. Parasinna diehli Kobes. Sundaland*. (Lower montane forest). Gariga argentilinea Walker. Endemic. (Lowland). Dumatha herbida Walker. Sundaland**, Sulawesi. (Lowland, lower montane). Camptoloma mirabilis Roepke. Sundaland. (Montane). Aiteta trigoniphora Hampson. Indo-Australian tropics to New Guinea. Lowland (and upper montane) forest. Aiteta damnipennis Walker. Oriental tropics. (Lowland forest). Aiteta musculina Walker. Taiwan, Sundaland to Moluccas. (Lowland swamp forest). Aiteta brooksi Holloway. Burma, Andamans, Sundaland. Lowland (and upper montane) forest. “Aiteta” deminutiva Warren. Sundaland to Solomons. Lowland (and montane) forest. Carea varipes Walker. Oriental tropics. Lowland to lower montane forest. Carea parangulata Kobes. Sundaland*, ?Palawan. (Lowland to montane). Diehlea diplogramma Hampson. Sundaland. Lowland. Diehlea holophaea Hampson. Sundaland. (Lowland). Diehlea tumida Hampson. Sundaland, Andamans, Palawan, Sulawesi. Lowland and lower montane forest. Diehlea ducalis Bryk. Endemic. Upper montane forest. Chora repandens Walker. Sundaland, Wallacea, Seram. Lowland forest. Calymera carneplagiata Warren. Sundaland. Lowland forest. Calymera lauritzeni Kobes. Sundaland. (Disturbed lowland forest). Calymera lukaschi Kobes. Sundaland*. (Coastal and secondary forest). Calymera fratella Kobes. Sundaland*. (Lowland forest). Calymera nigridiscata sp. n.. Endemic. (Upper montane). Calymera pollex Kobes. Sundaland*. (Lowland forest). Calymera jacobsoni Roepke. Sundaland. (Lowland and plantation forest). Calymera longicornis Prout. Sundaland*. Upper montane forest. Calymera sabulosa Warren. N.E. Himalaya, Sundaland. Upper montane forest. Calymera metaphaea Hampson. Sundaland. Lowland and lower montane forest. Calymera ?cuprea Wileman & West. Philippines, Borneo. Upper montane forest. Calymera vinacea sp. n.. Endemic. (Lowland forest). Calymera endophaea Hampson. Oriental tropics. (Lowland), lower and upper montane forest. Calymera venusta Warren. Sundaland. Lower to upper montane forest. Calymera antennata Warren. Sundaland*. Upper montane forest. Calymera picta Moore. Himalaya, Sundaland*. (Upper montane). Calymera negativapex Holloway. Endemic. Upper montane forest. Calymera elaeogramma Prout. Endemic. Upper montane forest. Calymera translucens Holloway. Sundaland*. (Lowland to upper montane forest). Calymera albimargo Warren. Endemic. (Lowland to) upper montane forest. Calymera elaeospila Prout. Endemic. Upper montane forest. Xenochroa chlorostigma Hampson. Oriental tropics. (Lowland and montane forest). Xenochroa costiplaga Swinhoe. Indo-Australian tropics to New Guinea. Lowland forest. Xenochroa argentiviridis Holloway. Endemic. Lowland to upper montane forest. Xenochroa purpurea Hampson. Indian Subregion, Sundaland. (Lowland and montane forest). Xenochroa careoides Warren. Sundaland, Palawan, Andamans, Hainan. (Lowland and lower montane forest). Xenochroa argentipuncta Holloway. Sundaland*. (Lowland and montane forest). Xenochroa fuscosa Prout. Sundaland. Lowland (and lower montane) forest. Xenochroa obvia Hampson. Sundaland*, Philippines. (Lowland). Xenochroa dohora Kobes. ?N.E. Himalaya, Sundaland*. Lowland to upper montane forest. Xenochroa fuscomarginata Hampson. Sundaland. Lowland. Xenochroa fulvescens Warren. Sundaland. (Lowland and lower montane forest). Xenochroa sp. 10695. Sundaland**. Lowland forest. Xenochroa sp. 10696. Sundaland**. (Lowland forest). Xenochroa sp. 17860. Endemic. Lowland forest. Xenochroa sp. 17911. Endemic. (Coastal). Xenochroa argentipurpurea Holloway. Endemic. Upper montane forest. Xenochroa mathilda Swinhoe. Sundaland. Lowland forest. Xenochroa pryeri Druce. Sundaland. Lowland forest. Xenochroa verticata Warren. Sundaland. (Lowland and lower montane forest). Xenochroa calva Warren. Sundaland. (Lowland to montane forest). Xenochroa purpureolineata Hampson. Sundaland. Lower and upper montane forest. Xenochroa biviata Hampson. Sundaland. Lowland (and lower montane) forest. Xenochroa rubrifusa Hampson. Sundaland*. (Lowland forest). Xenochroa balteata Warren. Sundaland. (Lowland and lower montane forest). Xenochroa transpurpuralis Holloway. Sundaland*?. (Montane forest). Xenochroa plesiogramma Prout. Sundaland. (Lowland and lower montane forest). Xenochroa diluta Warren. Sundaland. (Upper montane). Xenochroa notodontina Felder. Sundaland. Upper montane forest. Xenochroa trilineata Warren. N.E. Himalaya, Sundaland. Lower and upper montane forest. Xenochroa ferrinigra Holloway. Endemic. Upper montane forest. Xenochroa ferriviridis Holloway. Endemic. Upper montane forest. Xenochroa mediogrisea Warren. Endemic. Upper montane forest. Xenochroa annae Swinhoe. Sundaland, Sulawesi. Lowland to lower montane forest. Xenochroa xanthia Hampson. N.E. Himalaya, Sundaland, Palawan. Lowland forest. Xenochroa leucocraspis Hampson. Endemic. (Lowland). Arrhapa frontalis Walker. Sundaland. (Lowland forest). Arrhapa robinsoni Swinhoe. Sundaland**. (Lowland). Didigua purpureoscripta Walker. Sundaland. Lowland forest. Didigua seticornis Walker. Sundaland. Lowland (and lower montane) forest. Didigua heidwigae Kobes. Sundaland. (Lowland forest, secondary and coastal forest). Didigua alticola sp. n.. Endemic. Upper montane forest. Didigua lilacina Hampson. N.E. Himalaya, Sundaland*. Lowland to montane forest. Didigua roseata sp. n.. Sundaland**. (Lowland). Didigua nana Kobes. Sundaland. Lowland, (lower montane). Didigua viridifusa Kobes. Sundaland*. Lowland (including secondary forest). Didigua mixticolor Warren. Sundaland. Lowland forest, (upper montane). Didigua subterminalis Prout. Endemic. (Lowland to) upper montane forest. Didigua vexilla Swinhoe. Sundaland. Lowland (and lower montane) forest. Didigua leucozona Prout. Endemic. Lowland to montane. Didigua viridifascia Swinhoe. Sundaland. Lowland (incl. coastal and secondary) forest. Didigua effusa Swinhoe. Sundaland. Lowland forest, plantation and coastal habitats. Didigua martini Kobes. Sundaland*. (Swamp forest, disturbed montane forest). Didigua nigridorsum sp. n.. Endemic. (Lowland forest). Didigua viridipennis Druce. Sundaland*. Lowland, mainly heath forest. Didigua padanga Swinhoe. Sundaland*. (Lowland forest). Didigua quadratipennis Walker. Sundaland. (Lowland heath forest). Maurilia iconica Walker. Indo-Australian tropics. Lowland forest and plantation forest. Maurilia undaira Swinhoe. Sundaland to New Guinea. Lowland to upper montane. Ariolica lineolata Walker. N.E. Himalaya, Sundaland, Palawan. (Lowland). Sinna calospila Hampson. Sundaland. Montane forest. Sinna floralis Hampson. Sundaland. (Lowland). Titulcia eximia Walker. Sundaland. (Lowland). Titulcia confictella Walker. N.E. Himalaya to Taiwan, Sundaland and Palawan. (Lowland and montane). Titulcia rufimargo Hampson. Sundaland. (Lowland). Titulcia meterythra Hampson. Sundaland. (Lowland). Chandica quadripennis Moore. Himalaya, Sundaland. (Montane). Chandica radula sp. n.. Sundaland*. Lowland and montane forest. Chandica ayama Kobes. Sundaland. (Lowland forest). Siglophora bella Butler. Sundaland. Lowland (and montane) forest. Siglophora hayata Kobes. Sundaland. Lowland forest. Siglophora haemoxantha Zerny. Sundaland, Philippines. (Lowland). Siglophora cymographa Hampson. Sundaland. (Lowland and montane forest). Siglophora langei Kobes. Sundaland. (Lowland forest). Siglophora ferreilutea Hampson. Himalaya to Japan and Sundaland. (Upper montane forest). Siglophora haematica Hampson. N.E. Himalaya, Sundaland. (Lowland). Siglophora malickyi Kobes. Sundaland. (Lowland). Cossedia erateinalis Walker. Endemic. (Lowland). Cossedia sp.. Sundaland*. (Upper montane). Cossedia hyriodes Hampson. Sundaland, Palawan. Lowland forest. Cossedia proesei Kobes. Sundaland. (Lowland forest). Cossedia altiproesei sp. n.. Endemic. (Lowland forest). Cossedia kobesi sp. n.. Sundaland*? (Lowland forest). Cossedia acolutha sp. n.. Endemic. Lowland forest. Lophothripa vitea Swinhoe. Indo-Australian tropics. (Lowland). Lasiolopha saturata Walker. Indo-Australian tropics. Lowland and montane forest. Labanda ceylusalis Walker. Sundaland**, Palawan, Sulawesi. Lowland to lower montane forest. Labanda saturalis Walker. Indo-Australian tropics. Lower and upper montane forest. Labanda quadralis sp. n.. Endemic. (Lowland). Labanda concinna sp. n.. Endemic. Lowland forest. Labanda dentilinea Walker. Sundaland**. (Lowland). Labanda herbealis Walker. Sri Lanka, Borneo. (Upper montane forest). Labanda striatula sp. n.. Endemic. (Lowland). Labanda contrastriatula sp. n.. Sundaland**. (Lowland (hill) forest). Labanda palliviridis sp. n.. N.E. Himalaya, Sundaland**. Lowland forest (and montane forest on limestone). Labanda umonea sp. n.. Endemic. Lowland forest. Labanda umbrosa Hampson. Burma, Sundaland**. (Lowland forest). Labanda viridumbrosa sp. n.. Endemic. (Lowland forest). Labanda carinata sp. n.. Endemic. (Lower montane forest on limestone). Labanda sp. 16727. Endemic. (Lowland to lower montane). Labanda sp. 17458. Endemic. (Lowland forest). Tathothripa continua Walker. India, Sundaland, Sulawesi, New Guinea. Lowland to upper montane forest. Plagiograpta macrodonta Hampson. Indian Subregion, Sundaland. Lower and upper montane forest. Plagiograpta gertae sp. n.. Endemic. (Lowland forest). Plagiograpta pseudocondensa sp. n.. Endemic. (Montane scrub on limestone). Plagiograpta lutzi sp. n.. Sundaland*. (Upper montane forest). Ariola coelisigna Walker. Indo-Australian tropics. (Lowland)?. Ariola gracilis sp. n.. Sundaland. Lowland to upper montane forest. Ariola bedawan sp. n.. Endemic. (Lowland forest). Ariola pallidithorax Warren. Sundaland, Sumbawa. (Upper montane forest). Ariola triangulifera Warren. Sundaland to Solomons. (Lowland to upper montane forest). Paracrama dulcissima Walker. Indo-Australian tropics. (Lowland). Paracrama latimargo Warren. Indo-Australian tropics. Lowland forest and cultivated areas, (upper montane forest). Asinduma exscripta Walker. Sundaland. Lowland to upper montane. Chloriola gratissima Walker. Thailand, Sundaland, Palawan. Lowland to upper montane forest. Arachnognatha meterythra Hampson. Burma, Singapore, Borneo. (Lowland). Arachnognatha metascotia Hampson. N.E. Himalaya, Borneo. (Lower montane forest). Maceda mansueta Walker. Indo-Australian tropics. (Lowland to upper montane forest). Detounda spurcata Walker. Sundaland to New Guinea. Lowland (and upper montane). Beara nubiferella Walker. Sundaland. Lowland. Beara cornuta Holloway. Sundaland. (Lowland, upper montane). Beara tortriciformis Strand. N.E. Himalaya, Taiwan, Sundaland. (Lowland forest). Erizada lichenaria Walker. Indian Subregion to Sundaland, Palawan. Lowland forest. Gelastocera castanea Moore. N.E. Himalaya, Sundaland. (Lowland forest). “Gelastocera” viridimacula Moore. Sundaland. (Lowland forest). Ptyonota formosa Hampson. Burma, Sundaland. Mangrove. Ptyonota carissima Wileman & West. Sundaland*, Wallacea. Lowland (and upper montane) forest. Negeta contrariata Walker. Indo-Australian tropics. Lowland to lower montane forest, including disturbed areas. Negeta aureata sp. n.. Sundaland*. (Lowland forest). Negeta montanata sp. n.. Endemic. (Upper montane forest). Negeta abbreviata Walker. Sundaland. (Lowland and lower montane forest). Urbona dentilinealis Moore. Andamans, Sundaland. Lowland forest. Urbona sublineata Walker. N.E. Himalaya, Burma, Borneo. Lowland forest. Urbona leucophaea Walker. N.E. Himalaya, Sundaland. (Lowland forest on limestone). “Urbona” chlorocrota Hampson. Oriental tropics. (Montane). Pterogonia nubes Hampson. Sri Lanka, Sundaland, Wallacea. Lowland (and lower montane) forest. Pterogonia aurigutta Walker. Indian Subregion to Sundaland. Lowland forest. Pterogonia cardinalis Holloway. Indo-Australian tropics to New Guinea. Westermannia superba Hübner. Indian Subregion, Sundaland, Palawan. (Lowland). Westermannia elliptica Bryk. Taiwan, Sundaland. (Montane). Westermannia argentea Hampson. Indian Subregion, Sundaland, S. Moluccas. (Lowland to upper montane). Westermannia triangularis Moore. Indian Subregion, Sundaland, Wallacea. (Lowland forest). Miaromima columbina Warren. Sundaland. Lowland (to upper montane) forest. Miaromima aquila Holloway. Endemic. (Lowland forest). Miaromima cornucopia Hampson. Indian Subregion*, Sundaland. Lowland (and lower montane) forest. Miaromima pangolina Holloway. Sundaland, Wallacea. Lowland forest. Miaromima naessigi Kobes. Himalaya, Sundaland*. (Lowland and upper montane forest). Earias vittella Fabricius. Indo-Australian tropics. (Lowland secondary vegetation). Earias flavida Felder. Indo-Australian tropics. Lowland to upper montane zones. Earias mjoebergi Prout. Sundaland**. (Lowland to upper montane forest). Earias cupreoviridis Walker. Old World tropics east to Moluccas. (Lowland). Triorbis aureovitta Hampson. N.E. Himalaya, Sundaland, Palawan, Sulawesi. Lowland (and lower montane) forest. Triorbis annulata Swinhoe. Burma, Sundaland**, Philippines. Lowland (to lower montane) forest. Gadirtha pulchra Butler. Indo-Australian tropics. (Lowland). Gadirtha inexacta Walker. N. India, Burma, Borneo. (Lowland (including coastal) forest). Gadirtha impingens Walker. Indo-Australian tropics. Lowland to upper montane. Plotheia exacta Semper. Borneo, Wallacea to Solomons. Upper montane. Plotheia viridalis Pagenstecher. Borneo, Sulawesi, Ambon, New Guinea. (Lowland forest). Lamprothripa scotia Hampson. N.E. Himalaya, Sundaland*. (Lowland to lower montane forest). Ptisciana seminivea Walker. Oriental tropics. Lowland forest. Phaeothripa morena Swinhoe. Sundaland. (Lowland, lower montane forest). Clettharina macrocorema sp. n.. Sundaland**. (Lowland forest). Negritothripa confluens Mell. Borneo, Java. (Lower montane forest). Negritothripa telisai sp. n.. Endemic. (Lowland heath forest). Negritothripa aureata sp. n.. Endemic. (Lowland and lower montane forest). Blenina lichenosa Moore. Oriental tropics to Sundaland, also New Guinea. Lowland to upper montane forest. Blenina malachitis Hampson. Sundaland, S. Moluccas, New Guinea. Lowland to upper montane forest. Blenina chlorophila Hampson. Indian Subregion, Taiwan, Sundaland**. Lowland to upper montane forest. Blenina quinaria Moore. N.E. Himalaya, W. China, Vietnam, Sundaland**, Philippines. Lowland to upper montane forest. Blenina donans Walker. Indo-Australian tropics. Lowland and lower montane forest. Blenina puloa Swinhoe Taiwan, Borneo, Wallacea. (Lowland). Risoba repugnans Walker. Indo-Australian tropics. Lowland. Risoba walshae sp. n.. Endemic. (Lowland). Risoba samarinda sp. n.. Sundaland*, Sulawesi. Disturbed lowland areas with secondary forest. Risoba guichardi sp. n.. Endemic. (Lowland forest). Risoba calaina Zerny. Sundaland, Wallacea. Lowland (to montane) forest. Risoba calainigrata sp. n.. Endemic. (Lowland to upper montane forest). Risoba martinii sp. n.. Endemic. (Lowland forest). Risoba jucunda Walker. Sundaland*. Lowland forest (and montane). Risoba orientalis Holloway. Endemic. (Montane). Risoba caeruleata sp. n.. Endemic. (Lowland and lower montane forest). Risoba thalasscura sp. n.. Endemic. (Lowland and montane forest). Risoba harmani sp. n.. Endemic. (Lowland and montane forest). Risoba glauca Hampson. Endemic. (Lowland). Risoba viridangulata sp. n.. Sundaland. Lowland forest. Risoba diversipennis Walker. Himalaya to New Guinea. (Lowland heath forest). Risoba basalis Moore. Oriental tropics. (Lowland to montane). Risoba obstructa Moore. Indo-Australian tropics. (Lowland). Risoba avola Bethune-Baker. Borneo, Philippines, S. Moluccas, New Guinea. Upper montane forest. Risoba vialis Moore. Oriental tropics. Upper montane forest. Risoba obscurivialis sp. n.. ?N.E. Himalaya, Sundaland, Sulawesi. (Lowland to montane). Risoba olivens Bethune-Baker. Sundaland*, Sulawesi to New Guinea. (Upper montane forest). Cacyparis tenuipalpis Snellen. Thailand, Sundaland, Sulawesi. (Lowland). Ballatha willotti sp. n.. Endemic. (Lowland forest). Didiguides semifervens Walker. Sundaland to Bismarcks. Lowland forest. Selepa celtis Moore. Indo-Australian tropics. (Lowland forest). Selepa plumbeata Hampson. Indian Subregion, Borneo. (Lowland). Selepa ocellata sp. n.. Endemic. (Lowland forest). Selepa nigralba Hampson. Indo-Australian tropics. (Lowland forest). Selepa discigera Walker. Indo-Australian tropics. (Lowland forest). Selepa murphyi sp. n.. Borneo, Singapore. (Mangrove forest). Selepa oranga Swinhoe. Endemic. (Lowland forest). Bryophilopsis orientalis Hampson. Christmas I. and (?) Andamans, Borneo, Palawan, Balabac, Sulawesi, Seram, Queensland. (Coastal). Plectothripa excisa Hampson. Sundaland, Sulawesi. (Montane). 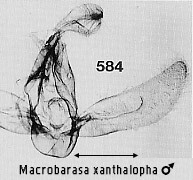 Macrobarasa xantholopha Hampson. Indo-Australian tropics to New Guinea. Lower and upper montane forest. Eligma narcissus Cramer. Oriental tropics and subtropics. (Lowland forest). Plagerepne torquata Tams. Sundaland. (Montane; forest and cultivation).